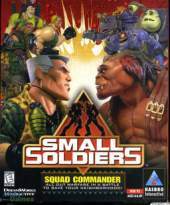 This is a single player Real Time Tactics game based on the movie Small Soldiers and targeted towards children. You can play as both the Commando Elite or Gorgonites in 20 missions (10 missions each) that replicate the settings from the movie. You control your squad with the mouse as you move through various settings like a house, shop and school, while shooting down the enemy's forces. Red Alert Junior Addition? Not quite, but that is the general premise. As the intro, each mission is usually proceeded by a small video clip featuring the characters animated via computer. They are not the quality level of the movie of course, but they are quite decent. The goal of the game, of course, is to conquer the enemy. You start off in a child's bedroom and fight your way throughout the city, rescuing comrades along the way. You start off with only being able to use 3 characters at any one time. Later you gain control of more, but it still leaves you with very small armies. There is also the lack of any real resource management. For a non 3d accelerated game, the graphics are good. Everything is pre-rendered in 3d accept for the characters, which appear to be typical sprites. Everything is quite colorful, and all the objects are rather large (once again, for the smaller players). The control is typical RTS fare, you click on a unit, click where you want him to move etc. However, it was too easy to use special weapons on your own troops. If you have a weapon selected and click on your own unit, instead of switching units, the old one fires on the other. Overall, for a children's game, this does very well. It opens up a new type of game to children where some actual thinking is involved, before you blow the enemy's brains out.